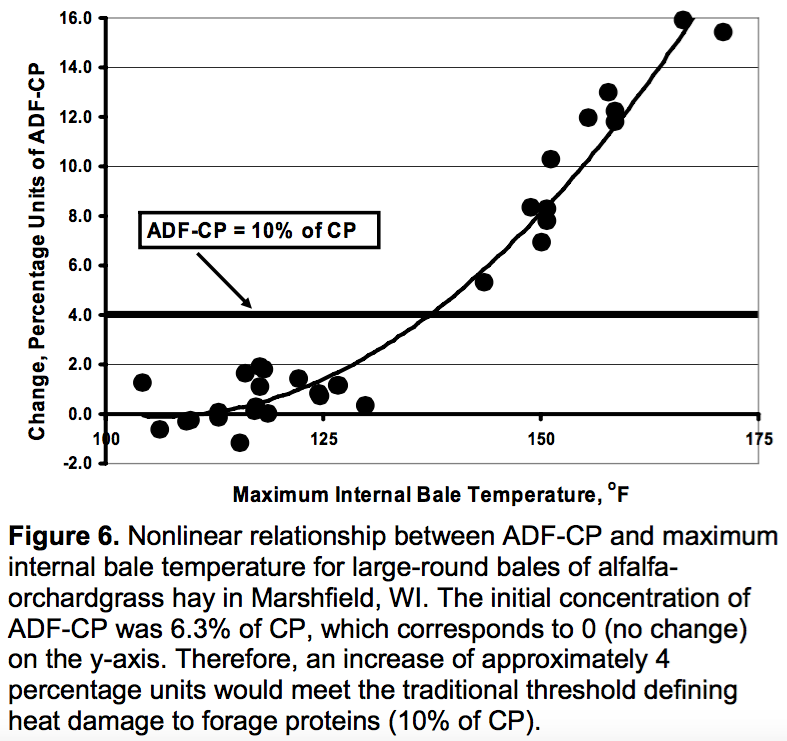 Traditionally, the effect of heat damage within forages has focused on reduced bioavailability of crude protein (CP) to ruminant animals as a result of Maillard reactions. The products of these reactions are the result of complex, multi-step pathways. Typically, the initial step of Maillard reactions involves the merging of certain plant carbohydrates (often sugars) with protein (amino acids). The undesirable consequence of this reaction is that forage proteins become less digestible to dairy cows or replacement heifers. However, recent research has shown that losses of energy from heated hays are perhaps more important. This Focus on Forage will highlight new perspectives on energy losses from heated forages. How is Forage Energy Calculated? TDN = truly digestible nonfiber carbohydrate (TD-NFC) + truly digestible crude protein (TD-CP) + truly digestible NDF (TD-NDF) + [truly digestible fat (TD-FAT) x 2.25] – metabolic correction factor. In this expression, the metabolic correction factor is based on extensive research and is a numerical constant equal to 7 percentage units of TDN. Typically, concentrations of fat in forages are very low. The most important truly digestible components summed to determine the final estimate of TDN for any forage are TD-NFC, TD-CP, and TD-NDF. How does spontaneous heating affect truly digestible nonfiber carbohydrate? measureable reduction in the energy available from the hay. How does spontaneous heating affect digestible protein? In the summative model, truly digestible crude protein (TD-CP) is estimated from the expression CP × e -1.2 x [ADICP/CP], where acid-detergent insoluble crude protein (ADICP) is used to adjust CP digestibility. The rather complicated multiplier (e -1.2 x [ADICP/CP]) serves as the digestibility coefficient for CP, and approaches 1.0 in unheated, high-quality hays. Oftentimes, it is arbitrarily assigned a value of 0.93 in order to avoid laboratory determination of ADICP, which is both cumbersome and expensive. This is a reasonable approximation for most dairy feeding applications, but it is less acceptable for heated forages. 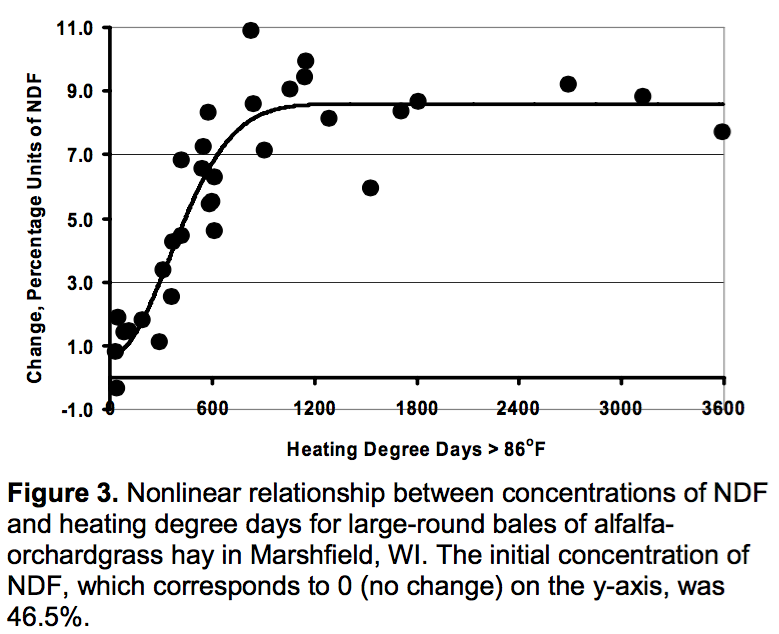 Across the range of heating depicted for alfalfa-orchardgrass hays made in large-round bales (Figure 2), this calculated digestibility coefficient ranged from 0.94 in unheated hays to a low of 0.76 for bales incurring the most severe heating. Overall, the relationship between changes in TD-CP (poststorage – prestorage; ∆TD-CP) and HDD can best be explained as a nonlinear decline in which the maximum depression in severely heated hays was about 2.6 percentage units of TDN. How does spontaneous heating affect fiber (NDF) digestibility? heat spontaneously, many Maillard reaction products are generated that are recovered as lignin; therefore, concentrations of lignin are associated very closely and positively with HDD. In recent studies (Figure 3), lignin concentrations increased during storage by about 73% in severely heated hays. An alternative method for determining TD- NDF requires inputs of NDF and a 48-hour in vitro determination of digestible fiber (NDFD; see https://fyi.extension.wisc.edu/forage/files/2014/01/NDFDig.pdf). The product of these inputs (TD-NDFndfd) often is used as a proxy for the TD-NDFlig method described previously. 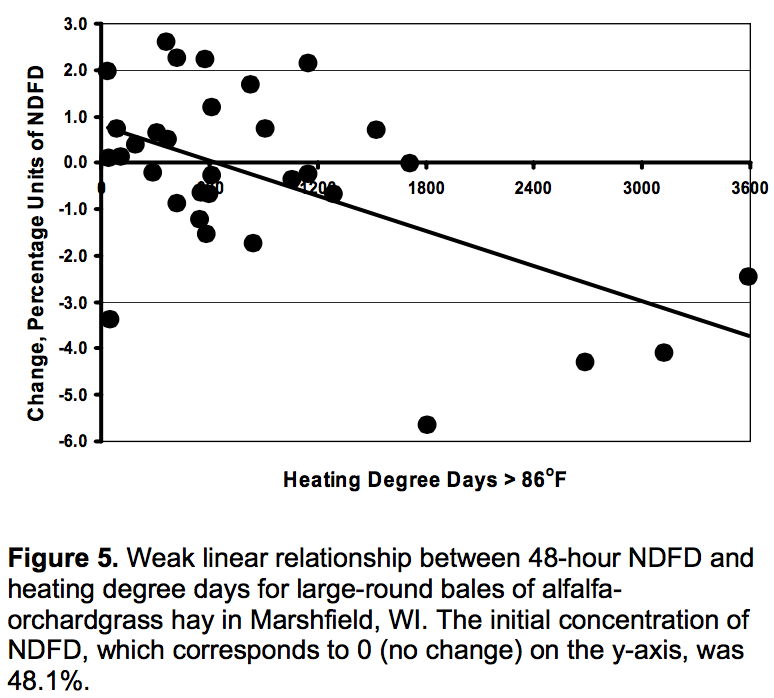 For our data set of large-round bales of alfalfa-orchardgrass hay, NDFD was poorly related to HDD; in fact, there was no statistical relationship at all if the four most severely heated hays were excluded from the data set (Figure 4). Although estimates of NDFD were largely nonresponsive to spontaneous heating, concentrations of NDF increased sharply in these same hays (Figure 5). It is important to note that concentrations of NDF in hays generally do not increase because more fiber is formed as a consequence of spontaneous heating. Rather, NDF concentrations increase because other (more desirable) forage components, such as plant sugars, are lost through respiration or volatilization. There is little difference between the TD-NDFlig and TD-NDFndfd methods for determining TD-NDF when hays are well managed and incur limited heating during storage. In modest to severely heated hays, the TD-NDFlig method will yield lower estimates of TD-NDF, relative to the TD-NDFndfd method, primarily because concentrations of artifact lignin increase sharply in response to heating (Figure 3). 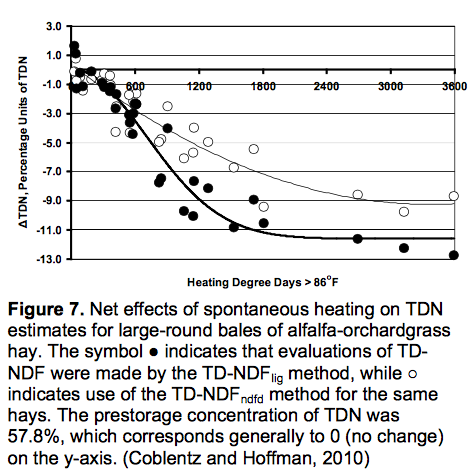 Net effects of spontaneous heating on TD-NDF are mildly positive when the TD-NDFndfd method is used. 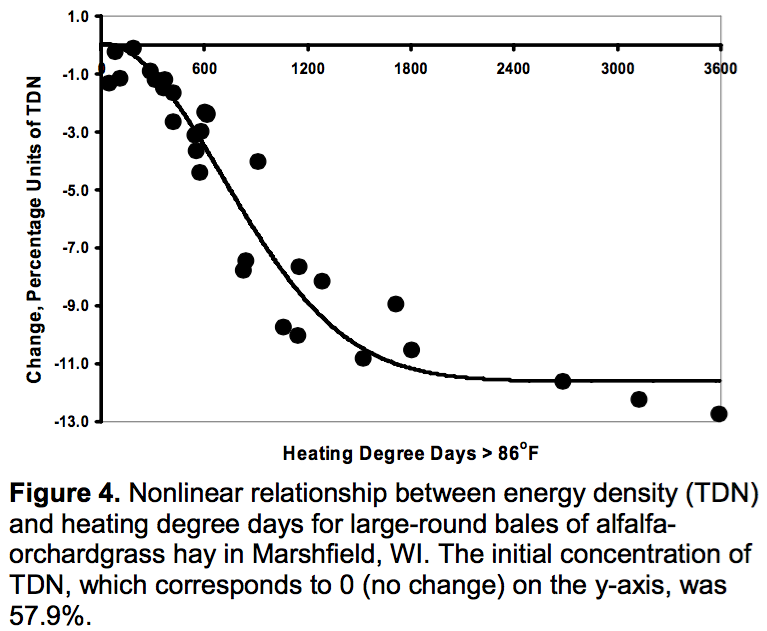 This occurs because estimates of NDFD are largely unresponsive to heating (Figure 4), but the overall concentration of forage fiber (NDF) increases sharply (Figure 5) over the same range of heating. The differential between estimates of TD-NDF determined by the TD-NDFlig and TD-NDFndfd methods may be as large as 4 percentage units of TDN in modest to several heated hays. After quantifying all the components contributing to the total TDN estimate, what are the net effects of spontaneous heating on the total TDN estimate? 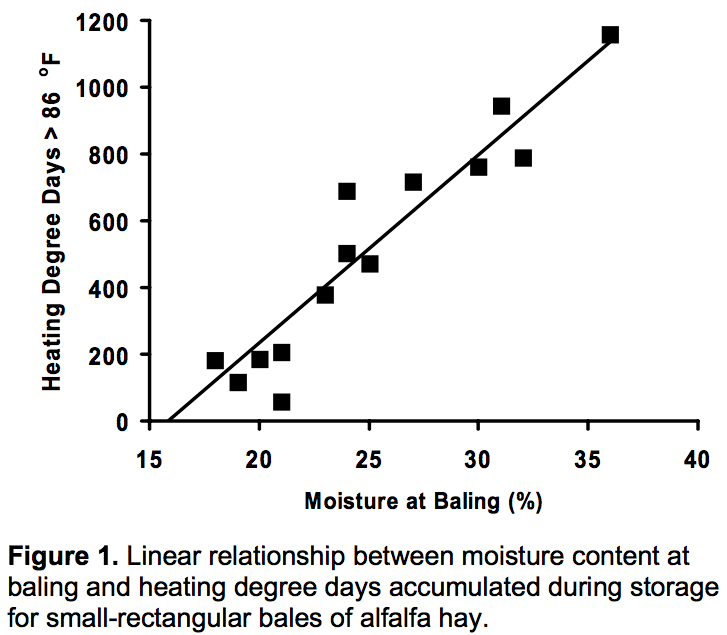 For the same set of hay bales discussed throughout this Focus on Forage, net effects of heating on estimates of TDN decreased in curvilinear patterns (Figure 7). In severely heated hays, reductions in TDN reached 9 to 12 percentage units, depending on methodology, which constitutes an enormous energy loss. Roughly 50 to 75% to of this loss was associated specifically with losses of TD-NFC (Figure 1). The effect of heating on TDN content within hays is further compounded because the relationship between TDN and heating is not a steady linear decline. Rather, the effects are somewhat ‘front loaded’; in other words, almost all of the losses for TDN are associated with only modest levels of heating. For severely heated hays, there is relatively little additional loss. Finally, the divergent estimates of TD-NDF created by the TD-NDFlig and TD-NDFndfd analytical approaches are clearly evident in Figure 7; TDN losses determined by the TD-NDFlig method were greater by 2 to 4 percentage units in severely heated hays. Overall, energy losses from heated hays have often been ignored in the past, with more educational emphasis placed on CP availability. This past emphasis is still important, but it often results in an understatement of the problem. Spontaneous heating becomes an increasingly likely phenomenon as hay packages become larger; associated losses of energy as a result of spontaneous heating are a serious problem at least equal in scope to depressions in CP availability. Are there any other analytical issues that are important when analyzing for TDN in heated hays? One additional consideration is worthy of discussion. The summative model approach described by NRC (2001) specifies that the TD-NDFndfd method can serve as an alternative or proxy method for estimating TD-NDFlig. Within this context, specified inputs are limited to the concentration of NDF in the forage, as well as the 48-hour in vitro digestibility of that NDF. In practice, there often are questions about whether the NDF concentration should be corrected for any residual CP associated with the forage NDF fraction (often abbreviated as NDICP). For unheated, high-quality legume hays, this fraction is relatively small, and this potential error often is either ignored entirely or a standard value based on past research is applied. In contrast, quantification of NDICP is already a required input for the TD-NDFlig method of estimating TD-NDF, although it may be circumvented by similar shortcuts in some laboratories. Recent research suggests that rather large errors in estimates of TD-NDF can occur when ‘shortcut’ concentrations of NDICP are used for heated hays. All estimates of TD-NDF should be corrected for NDICP if there is any corroborating evidence of heating during storage. Coblentz, W. K., and P. C. Hoffman. 2009. Effects of spontaneous heating on fiber composition, fiber digestibility, and in situ disappearance kinetics of NDF for alfalfa-orchardgrass hays. J. Dairy Sci. 92:2875- 2895. Coblentz, W. K., and P. C. Hoffman. 2010. 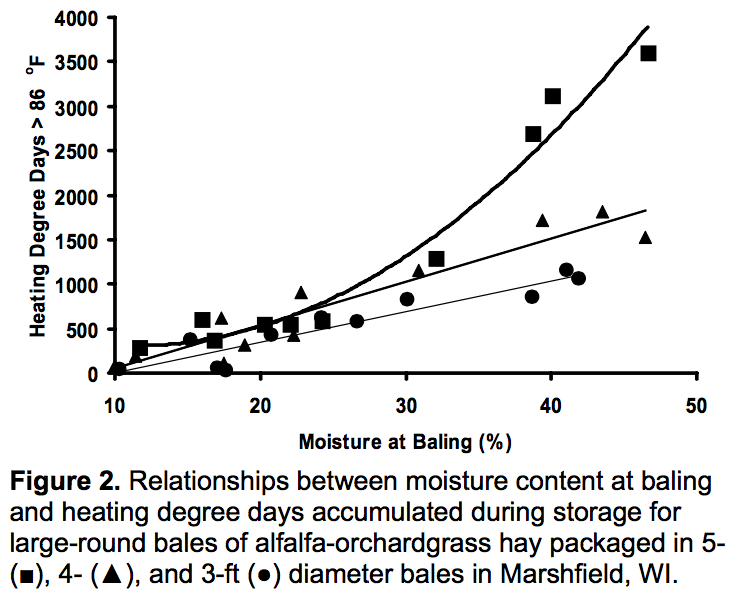 Effects of spontaneous heating on estimates of TDN for alfalfa- orchardgrass hays packaged in large-round bales. J. Dairy Sci. 93:3377-3389. NRC. 2001. Nutrient Requirements of Dairy Cattle. 7th rev. ed. National Academy Press, Washington, DC.